Low-Level Laser Therapy is nothing more than shining a high-intensity light into the area of interest, it’s just that this “light” is very intense, “monochromatic” (one wavelength), coherent (all the photons are in phase and synchronized) and is applied with a very specific dose in mind. It is painless, non-toxic, non-invasive, without drugs and very safe if applied by a trained practitioner. In short, LLLT reduces healing duration 30-40% and the injured tissues are stronger than if they had not been exposed to LLLT. We have tried to give a brief synopsis of LLLT and for those who want more information, can find a number of research abstracts from a number of websites available that document and prove the effectiveness of LLLT. 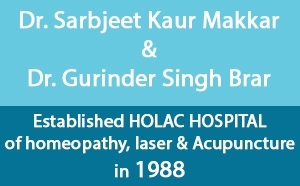 Holac Hospital has a wide range of Low-Level lasers of varying wavelength and powers for a different type of patients and procedures. LASER’s are also being used as a substitute for the needles in acupuncture. The procedure is known as LASOPUNCTURE.